It was hard to have a moment in the race that was more exciting than the side-by-side finish, but that just might have happened midway through the race as the leaders were exiting turn two. The #21 car of Ken Barry had spun into the infield, but no caution flag was thrown. Desperate to stay on the lead lap, Barry, drove back onto the track at the start of the backstretch. 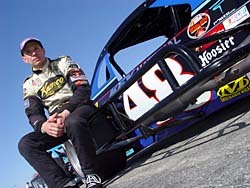 The only problem was that he did so directly in front of the three-way battle for the lead between Tony Hirschman, Ted Christopher and Mike Stefanik. The leaders split Barry’s car and even thought they came within inches of slamming into him. Stefanik managed to shoot by his competitors into the lead, but the caution was thrown because of the mess and the pass didn’t count. The fact that the incident involved three of the most talented drivers on the Tour might have kept the incident from being a total disaster. “There were some good drivers up there just using there heads,” said Stefanik. Hirschman had an experienced voice on his radio as his spotter. His son Tony, III, who has spotted in the IRL and NASCAR Busch Series, was spotting. But Hirschman said that the incident happened so fast that he can’t even recall what his spotter might have said. Hirschman was pretty fired up about the way that the whole incident happened. Barry was candid about his mistake and how it happened. When it comes to Hirschman being mad, Barry understand that too and wants to make things right. Although Zach Sylvester was all smiles after the race and a fine second-place finish, the fact that there was any late race cautions, especially the one that set up a green-white-checkered finish where he lost the lead, probably didn’t please him too much. But it was something that Sylvester had dealt with before. When the green flag waved on the final restart, Sylvester was watching the #50 of Chuck Hossfeld in his mirror. He wasn’t as concerned about the #13 of eventual winner Ted Christopher at that time. “I wanted to get through and get around to the finish, but Nevin and Hirschman kept rolling instead of putting their foot on the brake,” said Coby. Meanwhile, Barry wasn’t too happy about sitting defenseless on the frontstretch without a caution slowing the field down. I went to NASCAR and wanted to hear their version of what happened. They explained that everyone in the tower was watching the race for the lead to make sure nothing happened there. They just didn't see me sitting there until the leaders were in turn three. Barry also wasn’t too happy about the spin itself. Meanwhile, Kopec credits the feedback that Stefanik gave last year in making the #16 fast this season. Ted Christopher has now won the Icebreaker two years in a row. But the circumstances of each victory were extremely different. Last season, he finished second on the race track when apparent winner Todd Szegedy was DQ’ed in the tech line because of a rear end gear rules violation. TC found about his win with a cell phone call as he was leaving the track. This year, Christopher won after an epic three-way battle to the finish for the win. Dodge, Nissan and Kia dealerships in Massachusetts. The dealerships sponsor both Ken Bouchard and Flemke on the Mod Tour. Last season in the World Series at Thompson, Donny Lia and his #18 Lia Motorsports, Inc. team literally had the wheels fall over their wagon at Thompson International Speedway (CT). They finished 27th after a strong run in that event when a hub broke on their car. So this weekend, when the NASCAR Whelen Modified Tour returned to Thompson for the season opening Icebreaker, the LMI team didn’t spare any amount of preparation to make sure that the problem didn’t happen again. But there is no predicting a parts failure either. Lia led a few laps early in the race before the hub started giving him trouble again. Eventually, the team would fall three laps behind as the team replaced the hub and Lia motored on to a finish of 17th. Sylvester is only 21 years old and he takes pride in the fact that his crew is also fairly young. “The oldest guy on the crew is 34 years old and everyone else is under 30,” said Sylvester. On the final lap of the race, there were two incidents but no yellow flags displayed. 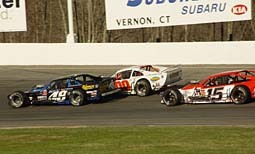 Ken Barry looped his #21 at the start finish line while Tony Hirschman and Nevin George went around in turns one and two. The lack of a caution perplexed some of the drivers. “I’m not too happy with the way that the last lap went,” said Doug Coby. 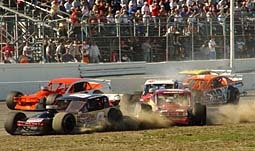 “There was a wreck on the frontstretch and then Hirschman wrecked in the corner. Throw the caution flag or someone is going to get hurt. Making the leaders race around to the frontstretch when there are two cars stopped there isn’t good. They were trying to win a race." Barry's #21 still sits on the frontstretch as Ted Christopher heads to victory lane in the background. Coby thinks that the melee might have cost him a position or two at the finish. “That was everything that we had, I thought that maybe if Mike could get by, he could make a hole for us,” said Kopec. Stefanik was very proud of how his protégé was able to run. Hirschman, as a veteran of the series, expected trouble at the end when there was a green-white-checkered finish. Rick Fuller looked pretty racy at Thompson. He was a threat for the lead throughout the second half of the race and finished fifth with a little bad luck towards the end. Nevertheless, he was still happy with his race. Another new pairing for 2005 is the combination of Eddie Flemke and the #10 Gary Teto team. They qualified well together and started the race on the outside of the front row. Flemke even led laps early on. The veteran driver correctly sensed that the early laps would be ugly and tried to be conservative, but even that didn’t keep him from getting caught up in a wreck not of his making. The Icebreaker wasn’t the first start for Doug Coby with the #77 Curt Chase-owned team. They raced together at the Thompson World Series and in the North vs. South Shootout last fall. But it was the start of their first season together. It was a strong day for the pairing. Coby ran towards the front all day and finished in the ninth position. Ever the racer though, Coby knows that things could have been just a bit better. Hirschman blames the worn tires for having a partial role in his getting spun out on the final lap. “You know, you are sort of helpless when you have no tire left in the back and no bite,” said Hirschman. There were a few feel-good stories after the race. Zach Sylvester’s near win was one storyline that thrilled the fans. Another one was the fine run to a sixth-place finish by Chris Kopec. 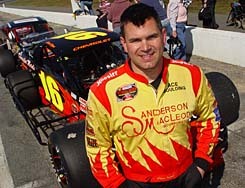 The finish came after Kopec sat out for the 2004 season to let Mike Stefanik into his #16 car. Kopec credited the help of the voice in his ear during the race to help him avoid trouble and get the best result possible during the wreck-filled 150 lap event. It must have been a surreal experience for both drivers when Kopec raced wheel to wheel with the previous driver of his #16, Mike Stefanik, in the late stages of the race. Stefanik got the best of the battle and finished fourth, which might have even helped Kopec. Tony Hirschman looked like a threat for the lead until the last few laps. That is went the tires went away on his #48 car. He dropped back to the bottom have of the top ten before getting spun around on the last lap and finishing 11th. The #16 of Kopec and Stefanik's #00 do battle. 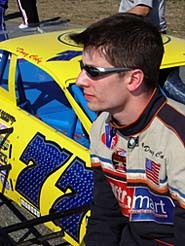 Tyler Haydt made his NASCAR Whelen Modified Tour debut at Thompson in the seat of the #28 Don King-owned car. The day was nothing short of spectacular for the Pennsylvania teenager. He was able to make up a lap after early race problems and ended up getting up to an eighth-place finish at the end. There was plenty of action around Haydt throughout the day. Mike Christopher (#79) runs under his brother Teddy's #13. In the driver’s meeting, NASCAR’s Don Hawk told drivers that actual Whelen Modified Tour drivers and their cars would be featured in the upcoming EA Sports video game, NASCAR 2006, that will be in stores well before the Christmas holiday. for repairs for many laps in the middle of the race. He finished second in Modified Tour points last season and is not down about a bad finish at Thompson. Regardless of the finish, Flemke was thrilled though with the performance of his new team. On the final lap, Chris Kopec and Tony Hirschman got together while racing for position. Hirschman got the worse of the deal, spinning into the infield and dropping to 11th as Kopec finished sixth. However, both drivers thought of the tangle as nothing more than a racing incident. 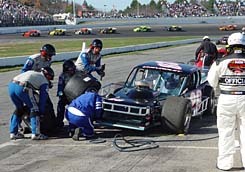 The 2005 version of the game featured Modifieds at tracks such as Martinsville and Nazareth, but used generic paint schemes and fictional drivers. Donny Lia has played many video games in his time. He is an active participant in online racing leagues and loves the idea that he and his closest competitors will be included in a game. Lia also sees another hidden benefit to the game. “I can go on there and crash into them and take out all my frustrations from the race before without tearing up any equipment,” said Lia. Mike Christopher debuted with the #79 Hillbilly Racing team at Thompson. They were luckless during the 150 lap race with all kinds of problems keeping them to a finish of 24th. 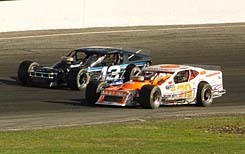 Sylvester keeps his #15 in the tire tracks of champions Tony Hirschman (#48) and Mike Steafnik (#00). The young driver would beat both at the end of the race. It was an all Bouchard front row. Coming soon to a video game near you? After the redraw, the front row for the race was heavy on the Bouchard influence. His brother, Ken, started the race on the pole while the outside front row starter was Eddie Flemke, his brother-in-law and driver of the Ron Bouchard Auto Stores #10 car. Before that, Lia had already run two races at Thompson over the weekend. He was entered in twin features for the SK Modified division driving the #47 Wisk car. On Saturday, Lia finished seventh and on Sunday, he was battling for second place when he got involved in a spin and dropped to the end of the lead pack with only five laps to go. Lia moved up to finish eighth at the end of the race. He enjoyed racing the SK and learned a lot prior to starting a full season of racing the car at Stafford Motor Speedway. Eventually, Christopher retired on lap 122 with transmission troubles. Still, Christopher was all smiles after the race because of the potential of his new deal. 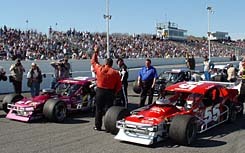 The Icebreaker was the first NASCAR Whelen Modified Tour race that used the “Lucky Dog” rule already in place for NASCAR’s top divisions. The rule allows the first car one lap down to make up a lap under a caution flag. The rule was announced in Sunday’s drivers meeting and will not be in place for any restart with less than ten laps to go. Modified legend Ron Bouchard hasn’t driven a race in years, but at the Icebreaker, he had his hands all over the event. And the handling was a little lacking with the new Modified Tour tires this year. Chir Kopec got into the Tony Hirschman on the final lap in a racing incident. Lia was quick to praise the Wisk team. Pulling double-duty at the track took some getting used to though as a driver. There was one time in particular when Lia wishes that he could have been in two places at the same time. But Lia knows that he can juggle the two schedules with little difficulty because of the teams that he is with. “I have two really good teams and that makes it possible,” said Lia. Lia will have next weekend off in both cars and will return to action on April 23rd and 24th at Stafford Motor Speedway with both the #18 LMI Modified Tour entry and the #47 Wisk SK Modified. Donny Lia had fun in his #47 SK, uh Sunoco, Modified at Thompson. Tyler Haydt pits his #28. Flemke slides through the infield after Nevin George and his #0 car.